In organic chemistry, the term aromaticity is formally used to describe an unusually stable nature of some flat rings of atoms. These structures contain a number of double bonds that interact with each other according to certain rules. As a result of their being so stable, such rings tend to form easily, and once formed, tend to be difficult to break in chemical reactions. Since one of the most commonly encountered aromatic system of compounds in organic chemistry is based on derivatives of the prototypical aromatic compound benzene (common in petroleum), the word “aromatic” is occasionally used to refer informally to benzene derivatives, and this is how it was first defined. Nevertheless, many non-benzene aromatic compounds exist. In living organisms, for example, the most common aromatic rings are the double-ringed bases in RNA and DNA. The earliest use of the term “aromatic” was in an article by terpenes, had chemical properties we recognize today are similar to unsaturated petroleum hydrocarbons like benzene. In terms of the electronic nature of the molecule, aromaticity describes the way a conjugated ring of unsaturated bonds, lone pairs of electrons, or empty molecular orbitals exhibit a stabilization stronger than would be expected by the stabilization of conjugation alone. Aromaticity can be considered a manifestation of cyclic delocalization and of resonance. This is usually considered to be because electrons are free to cycle around circular arrangements of atoms that are alternately single- and double-bonded to one another. These bonds may be seen as a hybrid of a single bond and a double bond, each bond in the ring identical to every other. This commonly seen model of aromatic rings, namely the idea that benzene was formed from a six-membered carbon ring with alternating single and double bonds (cyclohexatriene), was developed by August Kekulé (see History section below). The model for benzene consists of two resonance forms, which corresponds to the double and single bonds superimposing to produce six one-and-a-half bonds. Benzene is a more stable molecule than would be expected without accounting for charge delocalization. As is standard for resonance diagrams, the use of a double-headed arrow indicates that two structures are not distinct entities but merely hypothetical possibilities. Neither is an accurate representation of the actual compound, which is best represented by a hybrid (average) of these structures, as can be seen at right. A C=C bond is shorter than a C−C bond, but benzene is perfectly hexagonal—all six carbon-carbon bonds have the same length, intermediate between that of a single and that of a double bond. The first known use of the word "aromatic" as a chemical term— namely, to apply to compounds that contain the terpenes, which are not aromatic in the chemical sense. But terpenes and benzenoid substances do have a chemical characteristic in common, namely higher unsaturation indices than many aliphatic compounds, and Hofmann may not have been making a distinction between the two categories. Between 1897 and 1906, Sir Robert Robinson, who was apparently the first (in 1925) to coin the term aromatic sextet as a group of six electrons that resists disruption. In fact, this concept can be traced further back, via Ernest Crocker in 1922, to Henry Edward Armstrong, who in 1890 wrote "the (six) centric affinities act within a cycle...benzene may be represented by a double ring (sic) ... and when an additive compound is formed, the inner cycle of affinity suffers disruption, the contiguous carbon-atoms to which nothing has been attached of necessity acquire the ethylenic condition". Here, Armstrong is describing at least four modern concepts. First, his "affinity" is better known nowadays as the electron, which was to be discovered only seven years later by J. J. Thomson. Second, he is describing electrophilic aromatic substitution, proceeding (third) through a Wheland intermediate, in which (fourth) the conjugation of the ring is broken. He introduced the symbol C centered on the ring as a shorthand for the inner cycle, thus anticipating Erich Clar's notation. It is argued that he also anticipated the nature of wave mechanics, since he recognized that his affinities had direction, not merely being point particles, and collectively having a distribution that could be altered by introducing substituents onto the benzene ring (much as the distribution of the electric charge in a body is altered by bringing it near to another body). Many of the earliest-known examples of aromatic compounds, such as benzene and toluene, have distinctive pleasant smells. This property led to the term "aromatic" for this class of compounds, and hence the term "aromaticity" for the eventually discovered electronic property. Planar monocyclic molecules containing 4n π electrons are called antiaromatic and are, in general, destabilized. Molecules that could be antiaromatic will tend to alter their electronic or conformational structure to avoid this situation, thereby becoming non-aromatic. For example, cyclooctatetraene (COT) distorts itself out of planarity, breaking π overlap between adjacent double bonds. Relatively recently, cyclobutadiene was discovered to adopt an asymmetric, rectangular configuration in which single and double bonds indeed alternate; there is no resonance and the single bonds are markedly longer than the double bonds, reducing unfavorable p-orbital overlap. This reduction of symmetry lifts the degeneracy of the two formerly non-bonding molecular orbitals, which by Hund's rule forces the two unpaired electrons into a new, weakly bonding orbital (and also creates a weakly antibonding orbital). Hence, cyclobutadiene is non-aromatic; the strain of the asymmetric configuration outweighs the anti-aromatic destabilization that would afflict the symmetric, square configuration. Aromatic compounds play key roles in the biochemistry of all living things. The four aromatic amino acids histidine, phenylalanine, tryptophan, and tyrosine each serve as one of the 20 basic building-blocks of proteins. Further, all 5 nucleotides (adenine, thymine, cytosine, guanine, and uracil) that make up the sequence of the genetic code in DNA and RNA are aromatic purines or pyrimidines. The molecule heme contains an aromatic system with 22 π electrons. Chlorophyll also has a similar aromatic system. Benzene, as well as most other annulenes (cyclodecapentaene excepted) with the formula CnHn where n is an even number, such as cyclotetradecaheptaene. 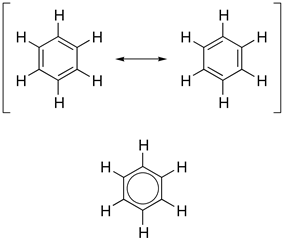 Polycyclic aromatic hydrocarbons are molecules containing two or more simple aromatic rings fused together by sharing two neighboring carbon atoms (see also simple aromatic rings). Examples are naphthalene, anthracene, and phenanthrene. Aromaticity is found in ions as well: the cyclopropenyl cation (2e system), the cyclopentadienyl anion (6e system), the tropylium ion (6e), and the cyclooctatetraene dianion (10e). Aromatic properties have been attributed to non-benzenoid compounds such as tropone. Aromatic properties are tested to the limit in a class of compounds called cyclophanes. Aromaticity also occurs in compounds that are not carbocyclic or heterocyclic; inorganic six-membered-ring compounds analogous to benzene have been synthesized. For example, borazine is a six-membered ring composed of alternating boron and nitrogen atoms, each with one hydrogen attached. It has a delocalized π system and undergoes electrophilic substitution reactions as usual for aromatic rings rather than reactions that would be expected if it were not aromatic. Quite recently, the aromaticity of planar Si56− rings occurring in the Zintl phase Li12Si7 was experimentally evidenced by Li solid state NMR. Metal aromaticity is believed to exist in certain metal clusters of aluminium among others. Homoaromaticity is the term used to describe systems where conjugation is interrupted by a single sp³ hybridized carbon atom. 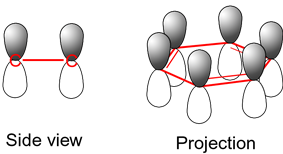 Möbius aromaticity occurs when a cyclic system of molecular orbitals, formed from pπ atomic orbitals and populated in a closed shell by 4n (n is an integer) electrons, is given a single half-twist to correspond to a Möbius strip. A π system with 4n electrons in a flat (non-twisted) ring would be anti-aromatic, and therefore highly unstable, due to the symmetry of the combinations of p atomic orbitals. By twisting the ring, the symmetry of the system changes and becomes allowed (see also Möbius–Hückel concept for details). Because the twist can be left-handed or right-handed, the resulting Möbius aromatics are dissymmetric or chiral. As of 2012, there is no proof that a Möbius aromatic molecule has been synthesized. Aromatics with two half-twists corresponding to the paradromic topologies were first suggested by Johann Listing. In carbo-benzene the ring bonds are extended with alkyne and allene groups. Y-aromaticity is a concept which was developed to explain the extraordinary stability and high basicity of the guanidinium cation. Guanidinium does not have a ring structure but has six π-electrons which are delocalized over the molecule. However, this concept is controversial and some authors have stressed different effects. ^ a b A. W. Hofmann (1855). "On Insolinic Acid". Proceedings of the Royal Society 8: 1–3. ^ Schleyer, Paul von Ragué (2001). "Introduction: Aromaticity". Chemical Reviews 101 (5): 1115–8. ^ A. T. Balaban, P. v. R. Schleyer and H. S. Rzepa (2005). "Crocker, Not Armit and Robinson, Begat the Six Aromatic Electrons". ^ Schleyer, Paul von Ragué (2005). "Introduction: DelocalizationPi and Sigma". Chemical Reviews 105 (10): 3433. ^ August Kekulé (1872). "Ueber einige Condensationsproducte des Aldehyds". Liebigs Ann. Chem. 162 (1): 77–124. ^ Armit, James Wilson; Robinson, Robert (1925). "CCXI. ?Polynuclear heterocyclic aromatic types. Part II. Some anhydronium bases". Journal of the Chemical Society, Transactions 127: 1604. ^ Ernest C. Crocker (1922). "Application Of The Octet Theory To Single-Ring Aromatic Compounds". ^ Henry Edward Armstrong (1890). "The structure of cycloid hydrocarbon". Proceedings of the Chemical Society (London) 6 (85): 95–106. ^ Z. Mucsi, B. Viskolcz, I. G. Csizmadia (2007). "A Quantitaive Scale for the Degree of Aromaticity and Anti-aromaticity". ^ Merino, Gabriel; Heine, Thomas; Seifert, Gotthard (2004). "The Induced Magnetic Field in Cyclic Molecules". Chemistry – A European Journal 10 (17): 4367. ^ "Borazine: to be or not to be aromatic". Structural Chemistry 18 (6): 833–839. 2007. ^ Alexander Kuhn, Puravankara Sreeraj, Rainer Pöttgen, Hans-Dieter Wiemhöfer, Martin Wilkening,Paul Heitjans (2011). "Li NMR Spectroscopy on Crystalline Li12Si7: Experimental Evidence for the Aromaticity of the Planar Cyclopentadienyl-Analogous Si56− Rings". Angew. Chem. Int. Ed. 50 (50): 12099. ^ IUPAC, Compendium of Chemical Terminology, 2nd ed. (the "Gold Book") (1997). Online corrected version: (2006–) "Homoaromatic". ^ D. Ajami, O. Oeckler, A. Simon, R. Herges (2003). "Synthesis of a Möbius aromatic hydrocarbon". Nature 426 (6968): 819–21. ^ Rzepa, Henry S. (2005). "A Double-Twist Möbius-Aromatic Conformation of Annulene". Organic Letters 7 (21): 4637–9. ^ Alberto Gobbi, Gemot Frenking (1993). "Y-Conjugated compounds: the equilibrium geometries and electronic structures of guanidine, guanidinium cation, urea, and 1,1-diaminoethylene". Journal of the American Chemical Society 115: 2362–2372. ^ Kenneth B. Wiberg (1990). "Resonance interactions in acyclic systems. 2. Y-Conjugated anions and cations". Journal of the American Chemical Society 112: 4177–4182. ^ R. Caminiti, A. Pieretti, L. Bencivenni, F. Ramondo, N. Sanna (1996). "Amidine N−C(N)−N Skeleton: Its Structure in Isolated and Hydrogen-Bonded Guanidines from ab Initio Calculations". The Journal of Physical Chemistry 100: 10928–10935.